playing without one of it’s stars just 90 minutes before kickoff. Carolina’s depth on the defensive line proved to be valuable as the unit showed that it can be dominant even without Pro Bowl defensive end Greg Hardy, who was deactivated before the game. 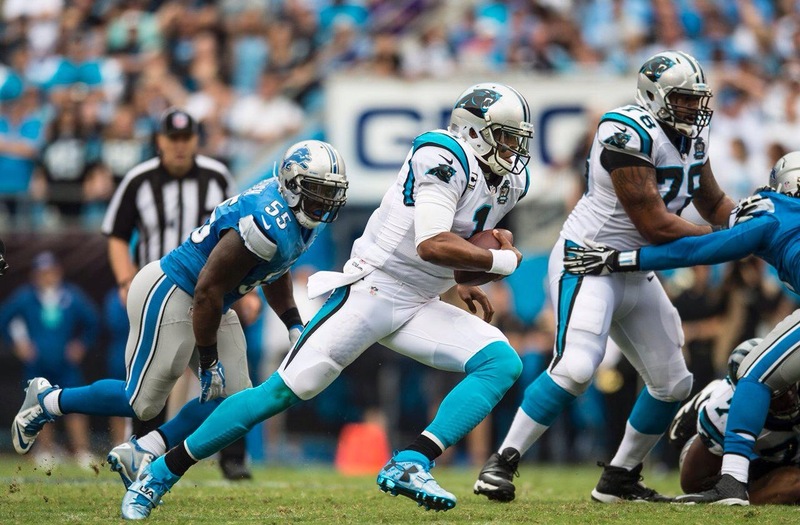 The Panthers’ front seven kept quarterback Matthew Stafford on the run, getting to him often and tallying 4 sacks. Defensive end Mario Addison, who saw added playing time in Hardy’s absence, more than doubled his sack total from last season with 2.5. The Panthers secondary also stepped up, holding a receiving weapon referred to as ‘Megatron’ to 83 yards, and no scores. He snagged a would-be touchdown catch late in the second quarter, but wasn’t able to hold on as safety Roman Harper closely trailed, keeping the Lions scoreless in the first half. 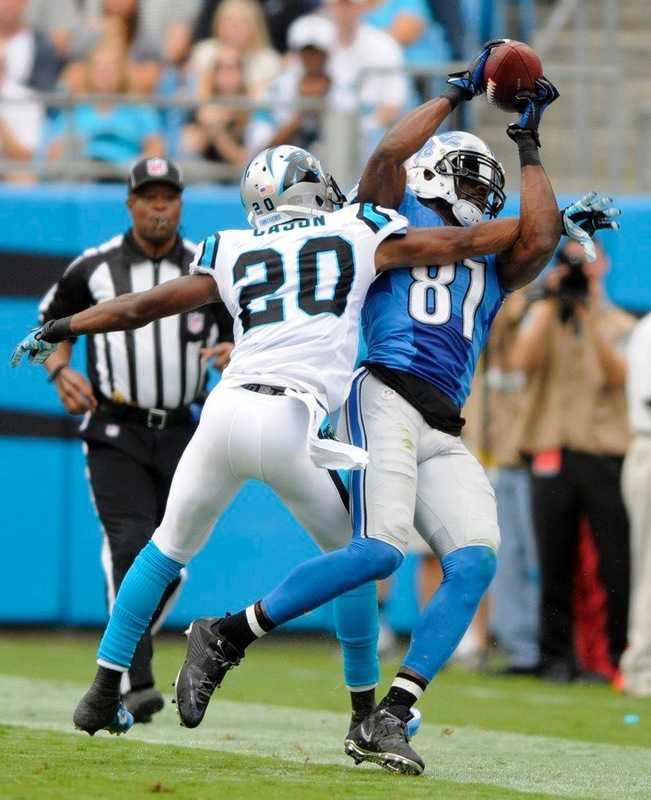 He was also targeted on a deep pass in the fourth – Passes that often end up putting defensive backs on Megatron posters – but a tip by Thomas Decoud led to a Melvin White interception, helping seal the victory for the Panthers. While no member of the rebuilt secondary matches up physically to Calvin Johnson, the unit did an exceptional job of limiting the best receiver in football to a relatively quiet afternoon. 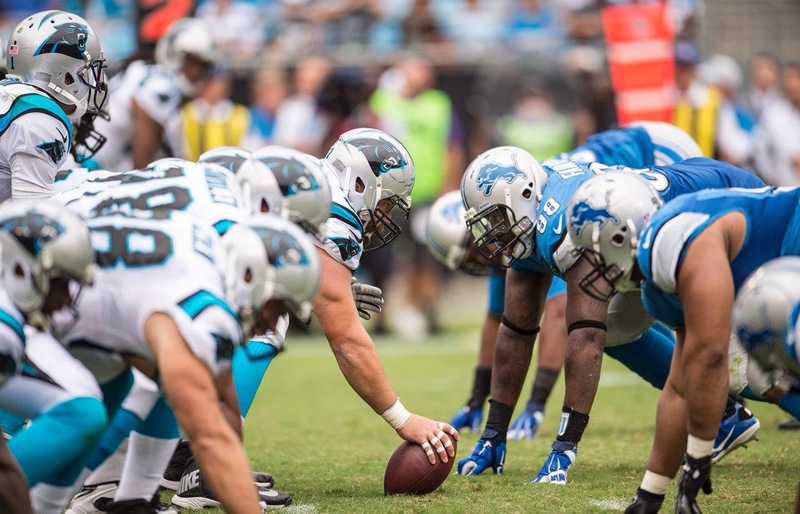 Offensively, Cam Newton and the Panthers were able to overcome a slow start, which gave the Lions most of the possession in the first quarter. In his first start of the season, coming off ankle surgery and a rib injury, Newton managed to move the ball enough for 2 Gano field goals and a halftime lead. After Detroit battled back to take the lead at 7-6, the offense really began to hit it’s stride. Newton responded with a 72-yard drive that was capped off by a precisely-threaded touchdown pass to Jason Avant. He later drove the team down to the 1-yard line with a diving effort to the pylon, resulting in Jonathan Stewart’s first touchdown run since 2012. (Pro-Football Reference). Newton finished the game 22-of-34 for 281 yards and a touchdown, but his most important stat of the day was his zero turnovers. Facing a relentless front seven, he was frequently flushed from the pocket, sacked 5 times, and hit many more – but was able to maintain his composure and protect the football, earning him a passer rating of 100.2. That is the mark of a maturing quarterback, one who has learned how to manage a game just as well as he can define it with highlight-reel plays. Carolina’s +3 turnover ratio proved to be the difference in the 24-7 win, and the young quarterback continues to prove his leadership ability. The Panthers, who are off to their first 2-0 start in the Rivera-Newton era, will now host the Pittsburgh Steelers on Sunday Night Football. The Steelers were unimpressive in their Thursday night game in Baltimore, falling 26-6 to their division rivals. But they’ve had the advantage of an extended week, a live-film session of the Panthers-Lions game, and the championship experience of Mike Tomlin and Ben Roethlisberger. Like Detroit, they too will face the best defense they’ve seen thus far – regardless of Greg Hardy’s status, which remains unknown. They will also have to stop a physical Carolina ground game, which is something the Steelers have struggled with in their first 2 weeks. 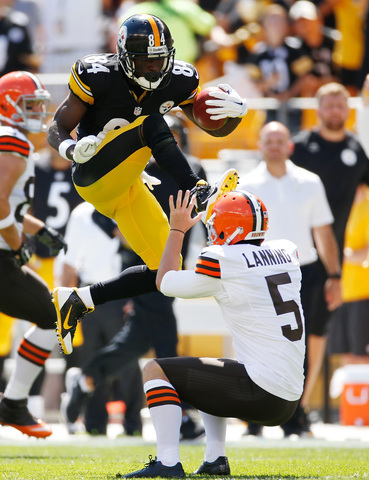 (Punter Brad Nortman will be on high alert for the hurdle-kick). Cornerbacks Melvin White, Antoine Cason, and Bene Benwikere did well to stop the larger receivers of the Buccaneers and Lions, but will need to play fast and work together to contain Brown and second year standout Markus Wheaton. The front seven’s gameplan for Big Ben will be similar to that of Matt Stafford’s last week. Both quarterbacks present a large frame, a rocket arm, and an ability to escape the pocket and extend plays when needed. To slow down a Roethlisberger passing attack that gashed Cleveland for 365 yards, the Panthers’ trademark pass-rushers will need to collapse the pocket and keep him from developing a rhythym. Much like with Stafford, it won’t just be about how many times he is sacked, but how often he is pressured and hit. To fill the void of inactive defensive ends Greg Hardy and Frank Alexander, the defense will need Charles Johnson to be dominant and role players like Addison and Kony Ealy to contribute. A second round draft pick, Ealy is an elite pass-rushing talent but has yet to have his breakout moment in the NFL. The Panthers boast a highly talented defensive line with unmatched depth, and will need to show it in primetime to help the secondary stay on Brown. Offensively, the Panthers will look to emulate the success of Baltimore’s ground game as they were able to rack up 157 rushing yards against the Steelers. This is good news for dynamic duo DeAngelo Williams & Jonathan Stewart, who should see more work than they did in week 2. While Williams was inactive due to a sore quad, he should be back in the lineup Sunday and primed for a big night. The offense will be facing a key contributor to Carolina’s 2013 success in strong safety Mike Mitchell. Mitchell brings a hard-hitting approach to the game that resonates well with the Steelers culture, but has been known to give up plays through the air. Something to watch in this game will be Carolina’s use of tight ends Greg Olsen and Ed Dickson. The Ravens were able to complete 2 play-action touchdown passes to their 2nd tight end, Owen Daniels. The Panthers have made it known they want to run more 2 tight end sets this season, so this is something they may try to exploit. For an in-depth breakdown on this matchup, check out my film breakdown of Daniels’ touchdown. In five regular season meetings, the Panthers are 1-4 against Pittsburgh, with their lone win coming in the franchise’s second season. This matchup will be the first season game the teams have played in the Rivera-Newton era, and the first time since reigning DPOY Luke Keuchly has anchored the Carolina defense.